I’m always impressed at how many people they can fit into the Vans Skatepark in Orange, Ca for the Pro-tec pool contest every year. 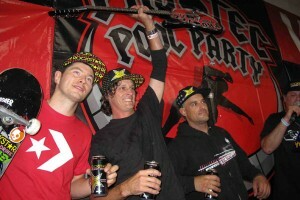 Bucky Lasek finally took first place after a five year battle for the gold. He ALWAYS ripped at the pro-tec pool party so it’s almost a shock that this is his first time winning the title of Pro-tec pool champ. Of course who else would place 2nd and 3rd but none other than the past years champs Rune Glifberg and Omar Hassan. Bucky Lasek left with a cool $25,000 in prize money this year and adds to his already growing stack of cash from skateboarding. The masters division was graced with another win by Chris Miller who I almost feel should just compete in the regular pro division with the other hot competition. The women’s division was won by a new comer Julie Kindstrand, who by the way is only 16 years old. If you weren’t there , don’t worry because you can view the entire contest during a one hour special on Fuel TV’s Meet & Brotatoes show August 10th at 8:00 pm. Another cool fact I would like to throw in is that unlike many of the obstacles professional compete on, you can actually skate the famous bowl at Vans Orange for yourself. It’s a cool way to really admire what these dudes are doing in the bowl once you see how hard it is to skate for yourself. Respect, for sure! Blind wins the Vans Downtown Showdown! Is it their year or what? After taking 1st place honors in Thrashers king of the road, they now take the 1st place team trophy at the Downtown Showdown. Their team really must mesh well together. And I’m super stoked to hear that Jani was voted the contest MVP because the dude deserves it and it’s awesome to hear someone out of the usual taking honors in something. Many people don’t even know he’s pro. He is a pretty low key dude who rips harder than anyone else out there. What about the obstacles? They were outright legit this year. As simple as the “3 pump dump” obstacle was you can tell it must have been the most fun to skate. Just trick after trick on those triple pyramids is tempting. “The Dive Bar” setup was sort of sketchy. It looked rad but notice all the near death experiences everyone had on it. Jake Duncombe pulled out a gnarly lipslide down the other end of the ramp which was crazy. Plus he pulled off the win in the “five points of pure evil” obstacle” with that massive transfer of his. And as difficult as it looks to skate for me, the “Lunar Eclipsy Hubba” seemed to have had more tricks pulled off on it than all the other obstacles. That one must have been the hardest to judge because dudes were pulling some proper tricks on the ledge and stairs simultaniously. I liked Billy Marks kickflip fastplant on the star in the middle of the stair set. That and Brian Anderson’s massive 360 flip. Overall too many people were ripping during the contest. I would have hated to have been the judge for this competition. But Blind had the overall points by the end and won the whole enchilada! Good show! The heightened awareness of the perils facing our environment has inspired companies throughout our industry to find creative ways of helping out, more so now than ever before. The surfing community, as much as any other, has risen up to take the lead on this cause. And why shouldn’t we? We as surfers are completely dependent on Mother Nature and her well-being. With that being said, substance alone usually won’t sell a whole lot of product. In order for products aimed at helping out the environment to be successful, it is imperative that companies are combining their substance with a whole lot of fresh style. 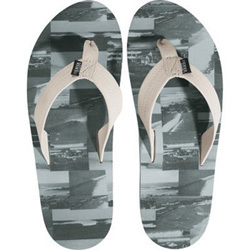 With the “Endangered Waves” sandal(or ’slippah’ for the braddahs out there) Vans and Surfrider have done just that. With the loss of prominent breaks over the last few years and the endangerment of so many more, Vans, Surfing Magazine and Surfrider Foundation have teamed up to produce a sandal featuring images of four of the most threatened waves from around the world. Ma’alaea in Hawaii, El Gongal in Spain, Bastion Point in Australia and Trestles in California can all be seen on the sandal. It’s a classy design and just an all around great looking set of footwear. Right now a surf break is being lost or otherwise diminished somewhere on this planet, people need to understand that waves are finite resources. Once they are lost or damaged it is difficult, if not impossible, to restore them. Thanks to Vans, a portion of proceeds, totaling $10,000, from the sales of these sandals will be donated to the Surfrider Foundation to assist them in their efforts to protect and preserve oceans, waves and beaches across the globe. Not only are they doing it with substance, but they’ve got a whole lot of style as well.